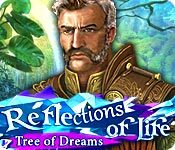 Reflections of Life: Tree of Dreams is rated 3.6 out of 5 by 25. Rated 5 out of 5 by Robcol from I loved this game It moved along well so it was mostly entertaining. It was a cut rate game so a real bargain. Rated 5 out of 5 by un1cornr0se from Very relaxing and a whole lot of fun! I thoroughly enjoyed this game. Was it one of the hardest HOGs I have ever played...no. That being said this was perfect for me as I enjoy playing a bit here and there, and being able to remember what I was doing when I come back to a game. The puzzles were easy to moderate for challenge, though there was two I had to skip as I just could not work them out. The graphics were very pretty, the music relaxing, and the storyline was good. I would happily play this one again. Rated 5 out of 5 by gamenast from Lots to do in this game This has been one of the best games I have played. The very best part is that it is VERY LONG, unlike many games. The music is easy to listen to and never intrudes, but accompanies perfectly. (I find that other games by GrandMa are also long; you do get your money's worth.) The only downside: the minigames are somewhat difficult and there is NO RESET button, so if you get lost, you stay lost. I must have hit the SKIP button more times than I played the minigame. Frustrating. Rated 5 out of 5 by SparkleGlow100 from Beautiful Game! An absolutely fantastic game! This is one of my favorite games. Everything about it is top-notch: the artwork, the graphics, the story. I love it!! Every second of it was enjoyable, from start to finish. Rated 5 out of 5 by pennmom36 from Where Do The Nightmares Go? When people of Earth fall asleep, the dreams they create come to life in the Dreamworld which feeds Vi Animo (roughly translated breathes life) the Tree of Dreams. Twenty five years ago, Grace was taken to an orphanage, with an amulet and a simple note, take care of our baby Grace she is in great danger! Grace assumed all these years that her parents were dead, but today she would find quite the opposite. A man claiming to be her Uncle Sominus stumbles into her living room through a full length mirror (a hand mirror would never work) telling her she must come with him if she wants to live! Well I'm not sure if this is a great idea because no sooner do those words spew out of his mouth, an ugly monstrous figure attacks him and drags him back into the mirror leaving behind a wise ole owl (yep he is indeed wise) and a crystal. Naturally Grace uses the crystal to transport herself and the owl into the world of dreams, which now seems to be the world of nightmares! This is a beautifully designed adventure game with bright vibrant colors and clever games, but you may want to consider upgrading to the Collectors Edition which has so much to offer. Achievements, Wallpapers, Concept Art, Music, Movies, a built in Strategy Guide, and a Bonus Chapter that can only be accessed after finding 176 Magic Leaves. Each scene has several leaves hidden (again only in the CE) and theres no need to worry if you've found them all because a tab will appear showing how many leaves are in that scene and how many are left to find. Many of the inventory items you find will have a plus sign indicator that means you either have to fix that item in the form of a mini game, or you need to combine that item with another item such as a filled tobacco pipe that you light with a flint. 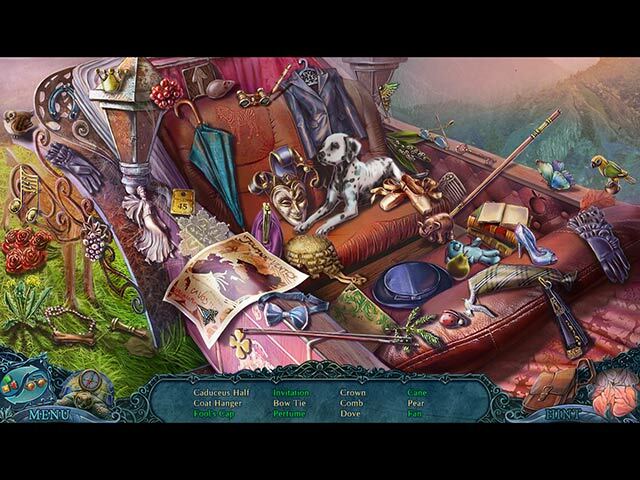 The Hidden Object Scenes are slightly interactive list finds where you may have to click on a purse or cabinet to open or place flowers onto a mask to create a mask with flowers. The scenes are repeated which is a feature I really don't like because it's too boring the second go round. The mini games range from super simple, such as swapping puzzle pieces to a variation of blocks where you have to drop keys from the top to the bottom keyhole by shifting several rows of blocks left and right to allow the keys to drop one row at a time, but you have to be careful that you don't permanently block in any keys. Your Uncle gives you that wise ole owl which turns out to be an attack owl who will vehemently attack those monsters on command. Whenever his services are needed you simply click on that area and guide him where to attack or what to retrieve! This is a fairly easy game to play, if you opt for the casual setting the map will show you areas that have something to do, or you can use the hint button which will show you the area you need to visit as well as ask if you want to teleport there quickly, enjoy! Rated 5 out of 5 by mrm2006 from My Family's Alive????? What Alternate World? Storyline: You are Grace, orphaned as a young child, and now that you've grown and it's time to move on from the orphanage some strange things have happened. You thought your parents were dead. You find an amulet with a note attached that says "please take care of our little girl". If that isn't shock enough, in the midst of a terrible storm, a man appears who says he's your Uncle and your entire family has been living in another dimension. Your amulet will allow you to travel through mirrors to different worlds. But, he says, the world where your family is, is dying. Evil darkness is spreading. He can say no more because ...... a monster comes out of the mirror and takes your Uncle back inside. Those monsters are being controlled by an even larger Evil. What can you do? You HAVE to find out if your parents are really alive. So, off you go through the portal that your mirror has become. In your desperation to help you find a prophecy. Are you the "forgotten child" who will save everyone? Is this YOUR destiny? Graphics: Pretty amazing. Not too dark and dreary but nothing bright and cheerful and cartoony either. The colors were a bit muted but I thing quite appropriate for the scenes. Sound: The voiceovers were great. As long as I can hear them and make out what's being said, that's a plus for me. Background music wasn't tedious and the sound effects were really good - from the windy rain storm to the owls. Game Play: There are 4 (or 5) mirrors (worlds) for you to go through. In the area where the mirrors were, I clicked on a large turtle and a dreamlike scene appeared with 5 mirrors - one had an angelic looking figure standing in front of it. They were named as follows: Lunos, Librios, Florus, Medios and Somnios. So 4 or 5? Guess we have to play the game to find out, huh? The object of the game is to go through all the mirrors and destroy the Evil that threatens to destroy the other worlds. It appears to be a long and arduous task. But, you have your Uncle's owl to help with things that are too high for you to reach - after you heal him. Don't worry - you don't have to name him or dress him or call him Cutey and he doesn't squawk, caw or speak. Silence is Golden - LOL. HOGs: Very nice to play for a change. Nothing dark and dreary. Nothing tiny and impossible to see. Yes, there were interactive items but for the most part straightforward itemized lists of items to locate. You can choose to play a match 3 game instead. Your reward, of course, is an inventory item. Mini Games: Some were very simple while others required some definite brain power. I had to skip one (for time's sake, when I own this game I'll definitely work on it until it's finished - HEY, did you get it? WHEN I buy it - HAH!). I'm sure those of you who played the demo know to which one I refer. You are armed with some usual things and some rather unusual things in this game. For instance, an "album" that holds important notes and story information. A map (looks like a compass) that is transportable and indicates where you are and where an active objective is. I love that you can zoom in or out of the map areas to get a better picture of where you are going. A briefcase that holds rare items that will help you throughout the game (but you never see them once they go in there - hm) and the customary tutorial you can choose to take or not. There are 3 modes of difficulty - casual, advanced and hard. There are also "plus items" in your inventory. So, in this not-s-little-nutshell, the game has been explained and reviewed. Anyhoo - (HAH, I said "hoo" - owl in the game - hoo hoo - I slay me - LOL). I encourage EVERYONE to try this game. The demo is free and you get a remarkable 90 minutes to play. I can almost bet most of you will really take to this game and want to hit that "BUY" button right away. Happy Gaming! Rated 5 out of 5 by boatgirl4347 from GRANDMA YOU BEAT THE BEST!!!!! IM ALMOST DONE WITH MAIN CE GAME AND I AM A MAZ ED A MA ZED!!! TO ME ITS THE GAME OF THE YEAR!! 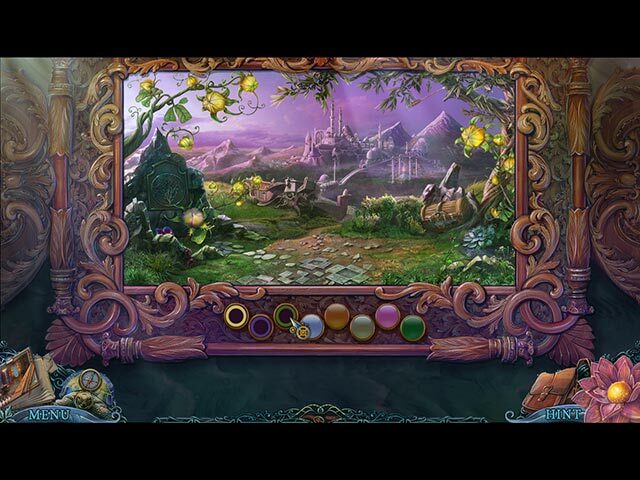 LET OTHERS TELL THE STORY I JUST WANT GRANDMA TO KNOW I THINK YOUR BRAINS ARE TOTALLY GENIUS THE STORY THE MAGNIFICENT COLOR THE DETAIL THE PERFECT FLOW OF THIS GAME ASTOUNDS ME!!! ITS LONG AND I NEVER WANT IT TO END THANK YOU FOR HOURS OF PURE DELIGHT GRANDMA I HOPE YOU ARE NOT TOO OLD TO BE GETTING ANOTHER PEARL READY SOOOOON!!! Rated 5 out of 5 by biscuitsmama from Beautiful Worlds to Explore - A Great Game Yes, once again we have a game about the struggle between good and evil, darkness and light but, IMHO, in Reflections of Life Tree of Dreams the storyline is excellent and put together in a way that captured my interest and . 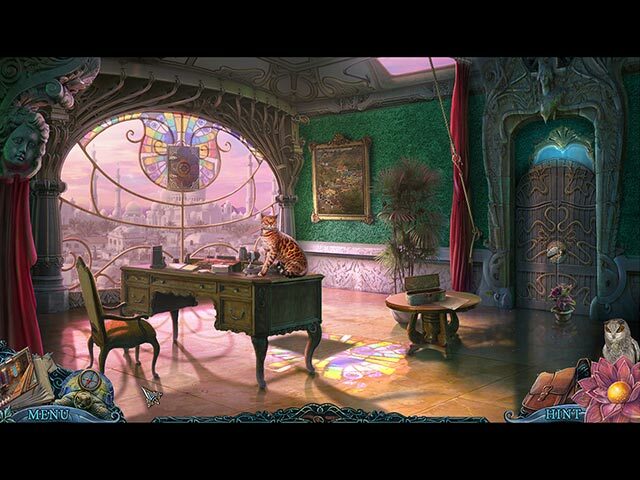 I’m not going to give a recap of the story since I think it is up to you to discover but I will say we have a game with parallel worlds and some beautiful locations to visit as we challenge the dark forces that surround us. The graphics are very good and the artwork is excellent and creates the beautiful fantasy worlds that I love to see in games. We also have lip-synced voiceovers that are quite realistic. You have a journal but it is not the type I like since most of it is done with video clips that need to be replayed. I happen to like the interactive transporter map in Tree of Life. It is very interactive and not only does it show where you have tasks available, it also allows you to zoom into different areas. This is a great way to do a map because we have a lot of territory to cover. The HOPs in the demo are the standard list type with some easy extra steps to find incomplete or hidden items. The good thing is that if you don’t want to search for items on the list, you have the option of switching to a match 3 game. The puzzles are mostly the type we have seen before, but realistically how many different types of puzzles can a developer come up with that we haven’t already encountered in one game or another. Most of the puzzles are very easy but once in a while you will encounter one that takes a bit more thought to solve. It doesn’t bother me that some of the puzzles are quite easy because they are still entertaining and fit into the story. Although we have seen the storyline done before, I liked Reflections of Life Tree of Dreams since it was artistically beautiful and held my attention throughout the game. I purchased the CE and was not disappointed. The game was entertaining and had some challenge to it, which is something I always like. As always, I recommend that you at least try the demo to see if this is a game you will like. Rated 4 out of 5 by newsreinerk from Visual appealling game I liked this game very much: I like to wander in new worlds. But it is not always clear what has to be done next, so I needed the hint button more often than usual. Story line and level of challenge are not the best parts of the game, but the graphics are. You have a helper pet and a way to get to otherwise unrelated locations, here worlds.